The Domaine Paul Blanck winery is deeply influenced by the terroir areas that represent two thirds of the total acreage. Trailblazers of the focus on the notion of terroir in Alsace, previous generations of Blancks have put their faith in the terroirs to give birth to authentic and natural wines. About 220,000 bottles leave the Paul Blanck cellar every year. One says of families long established on the same land that they are strongly rooted. 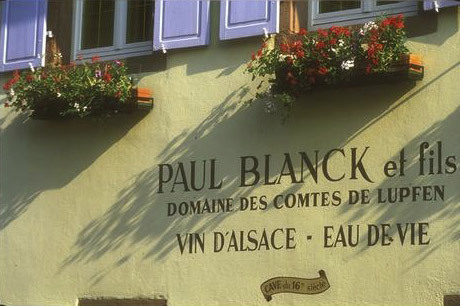 It should thus come as no surprise that the Domaine Paul Blanck winery is so intent on producing “terroir wines”, expressions of the unique combinations of grape varietals, soil, climate and craftsmanship. This approach is shared across generations with Frédéric and Philippe firm believers in the potential of Alsatian terroirs. Since taking over from their fathers in 1984, they take the time to nurture, shape and strengthen the bonds that bind wine lovers and connoisseurs to their wines. They create an exclusive relation with each terroir, the wine that it will produce, from the vineyard to the cellar, all the way to the person who drinks the wine. Anchored in tradition, the Blanck family is resolutely modern, and loves to share the stories behind their designer wines to the discerning wine lover in search of unique tasting experiences.